After signing with TVB in 2012, Ali Lee (李佳芯) has been given many opportunities and memorable roles. She began to receive attention for her acting after starring as a villain in Overachievers <名門暗戰> and became a household name for her breakthrough role in Legal Mavericks <踩過界>. 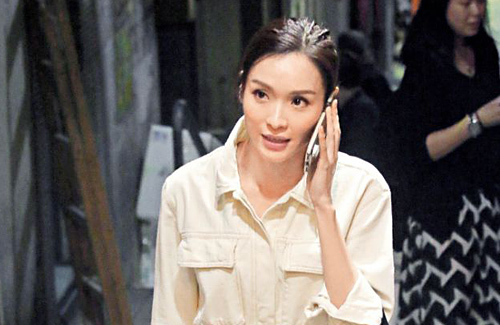 Ali continued proving her potential as a lead actress and became a hot favorite to win the TVB Best Actress award this year due to her believable portrayal of a new mother in Who Wants a Baby? <BB來了>.The 2018 TVB Anniversary Awards ceremony will take place tomorrow, and Ali’s biggest competitors are Mandy Wong (黃智雯) and Alice Chan (陳煒). Despite being a hot favorite, Ali may have inopportunely ruined her chances of snagging the Best Actress award. It was rumored that Ali upset many TVB higher-ups after rejecting to portray the lead role in the new TVB drama, After the Disaster <禍後>. An insider revealed, “Actually, Ali had already looked over the script and promised to film the drama, but she suddenly changed her tone and said she wasn’t going to film it. She said it was because the character is a mother with a toddler daughter, and she didn’t want to portray a mother again. On the other hand, it was said that the first lead male was going to be Frankie Lam (林文龍), so Ali felt that they did not look physically compatible. But it’s obvious these are all excuses! 5 comments to Ali Lee Lost Her Chances for TV Queen? As much as I would have loved to see Ali get the TV Queen award, I actually respect her more now for standing up for what she wants…………Over the years of reading about TVB’s culture, I can only say that it must be a S-hole of a place to work since they have monopolized the market for so long………..All the senior management and execs. at TVB are likely all A-holes also, and especially Virginia Lok, treating all the artiste’s like their slaves. Ali is probably wise enough that the TVB Queen or King award is a meaningless thing and that it only gives you a few more extra minutes in the limelight for the current year…………A lot of HK artistes don’t need such an “artificial” award simply created for the sake of taming obedient artistes on contract…………Ali should be above that and good for her! TVB has never been a nice boss especially to young artistes. It’s only veterans like Liza who can withstand the nonsense. Ali, Mandy and Alice Chan….these are the Fadans left?! They were all B list a year ago. Mandy and Alice? I like Alice in the show but she’s not leading that show was she? Is quality that poor?